Supposedly ruthless Catherine de Médicis, d. 1589, though the granddaughter of Lorenzo the Magnificent, was not born a royal. She was daughter of an Italian aristocrat Lorenzo Il de’ Medici, the Duke of Urbino, and Madeleine de la Tour D’Auvergne, Countess of Boulogne, who both died soon after her birth. She became queen consort to King Henri II of France from 1547 to 1559. She was pushed into the main political arena by the delicacy of her 15-year old son King Francois II (d.1560). She then became regent to her 10-year-old son King Charles IX (d.1574). 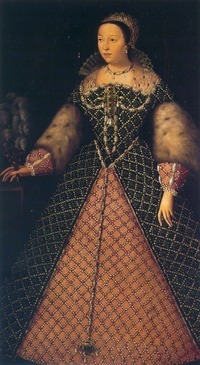 Thereafter she played a most important part in the reign of her third son, King Henri III. To all practical purposes she was the regal power throughout “the age of Catherine de Médicis” rather than her crowned sons. It was one of almost constant civil and religious war in France, in particular the St. Bartholomew’s Day Massacre of 1572 during and after which many thousands of Huguenots were killed in Paris and throughout France. Par son pourchas des razes sera/fera comble. Again we encounter the dual print-style for ‘s’ and ‘f’ (which seems to bother no one but myself). Often it makes little difference to the interpretation but sometimes it makes all the difference. Lines 3 and 4 could be intended as ‘sera-sera’ or ‘fera-fera’ or ‘sera-fera’ or ‘fera-sera’ and the translation will change more or less. Or the word ‘razes’ as used here could be from ‘raser’, to cut with a razor like a monk’s torse, or else ‘ras’ (‘ground-razing’ as used by Rabelais). It could also be from ‘rager’, to rage violently or ‘rese’ to make a military incursion/excursion into an enemy territory. Certainly ‘z’ or ‘ze’ are interchangeable with ‘s’ or ‘se’. As ‘vefue’ is the same as ‘veuve’ the phrase ‘vefue saincte’ must mean the ‘saintly widow’ but exactly why a widow should be saintly is a mystery unless it means ‘still virginal’ or ‘faithful unto death’ like the swan. Could this ‘saintly widow’ be Blanche II, d.1464, who wed Henry the Impotent King of Castile and stayed a virgin throughout her 13-year marriage (annulled) and possibly throughout her lifetime? Not quite a firm fit . Of course, the word OF ‘vefue’ is asexual so this could be a widower (Oliver Cromwell held himself high among the shaven Roundheads who were religious puritans with martial attitudes) but I’ll go with the commoner notion that Nostredame is genuflecting to the great power in France, Catharine de Médicis the sainted Queen Mother. Or any other permutation of these alternatives. The ‘rameaux’ are branches or divisions. Possibly her children, probably the warring religious factions. Or both. ‘Comble’ has various meanings from ‘cumulation’ or ‘beams supporting a roof’ or ‘the displacement of measuring rods’ or ‘a rising to the heights’ to ‘packed or wrapped away’ or even ‘paid-off’. If these are monks of the Inquistion it could be extended to mean planks/platforms for punishments meted out at the stake. Or it could mean a problem is sent sky-high. ‘Querelles’ tend to be life-threatening differences between clans. ‘Quererelles’ is either some old linguistic variation on this or a misprint. OF ‘pourchas’ sounds like a form of ‘prochaz’ derived from ‘pourchasser’. This could well be an alternative to ‘poursuivre’ and so would mean ‘chercher la femme’ in the Rabelasian sense, with ardour and assiduousness. If the man chosen to save the branches from their crises is too attentive to the widow the monks may make things publicly uncomfortable for them. There is nothing specific on record that fits to this general quatrain. Other than Catherine (and perhaps Cromwell) there are no particular candidates although there might have been some hearsay case of a local mother or father saving her own from the Inquisition. It is most probably Catherine de Médicis who is the faithful widow whilst the branches are her divided people and the ‘razes’ are some ‘shaved heads’ or else military incursions that figured in the religious troubles. By his impassioned pursuit of the shaven heads will further ramp things up. OR By his efforts the Count of Renne-le-Chateau will be made the superior party. History does not reveal who the crafty suitor might be who could make matters worse in this case. Probably there was no-one or possibly there have been too many to mention.